Any mechanic who drives or works on a car that has been lowered will tell you that jacking the car up into the air can be tricky, if not downright difficult. Whether the car is used for competitive racing, for autocross, as a show car, or one that just has a low factory ride height, the biggest difficulty in getting these cars up in the air is finding a way to slide a floor jack underneath. Even low profile floor jacks can sometimes have trouble with cars that are extremely low. Fortunately, Race Ramps has provided a solution to help mechanics get lowered cars in the air that is relatively quick and painless, and furthermore can save you the expense of shelling out for a pricey low profile floor jack. The Race Ramps RR-TJ-S Trak-Jax are an extremely low profile set of car ramps (also known as jack assist ramps) that allow a mechanic to give their car a quick three extra inches of ground clearance. The idea is that you put a Trak-Jax ramp at each of the four corners of your car. You then drive the car up the ramps, which elevates all four wheels. With the extra ground clearance, you can easily slide a floor jack underneath once you have elevated the car a little bit. The first thing that differentiates the Race Ramps Trak-Jax from other ramps is that they are very low profile, topping out at 3 inches of height. Most ramps tend to be 5 or 6 inches high, making them too tall to fit under extremely low cars. Due to their low profile, the ramp doesn’t interfere with any of the bodywork on the car as you drive up on to them. The other thing that differentiates the Trak-Jax from other ramps is that they have a very low angle of attack at 7.8 degrees. Other ramps tend to be steeper, which can mean scraping your body panels on the ramps before your wheels engage them. The Trak-Jax prevent this issue by using such a small angle of attack. As for other stats, the Race Ramps Trak-Jax are 12 inches wide, which should easily accommodate wide tires. Overall length is 30 inches, so these ramps are extremely portable making them an ideal choice to toss in your trailer so you can use them during track days. The ramps come equipped with a small lip to prevent you from rolling off the end as you are driving up, meaning that you don’t need a spotter to pull your car onto the ramps (although you still need wheel chocks). Weight is only 5 pounds each, so they won’t break your back if you have to move them around. The ramps have a rather high capacity as they can hold 1500 pounds per ramp according to Race Ramps. They are constructed using high density foam and feature a coating which provides a ramp with an extremely strong structure that offers considerable grip. Furthermore, they resist slide very well and tend to stay in place on most garage floors. Overall, if you are looking for low profile car ramps, we can’t recommend Race Ramps Trak-Jax enough. 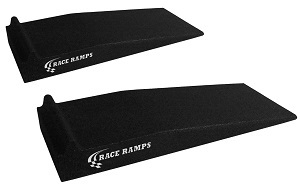 Race Ramps makes some of the highest quality ramps on the market and you won’t be disappointed! As for where to buy, Amazon’s price shipped is pretty darnattractive. Just remember that you’ll need four (two sets of two) if you want to get your entire car in the air. Click here to read more reviews, see more pictures, and see prices.